"Shaw Family and Mettie Phoebe (Smith) WADE....in the lower left. She was born in 1852 and she looks to be "over 35" so that would make the time about 1885 or later. It is probably taken in Branch County or St. Joseph's County, MI. I believe the gentleman in back (right) is a Native American and possibly the gentleman in the center. Mettie married Alphozo Wade in Leonidas, MI." Earlier, he wrote...."In researching my tree I found a photo of my gg grandmother with the Shaw family. (I can email that photo if you wish). My family does not know this family and we are not related. I think they took care of "Mettie" Smith after her mother died when she was 10 years old but anything is possible. Saving you the story I came upon Apponetus Shaws name and wondered if you knew anything of him or his family. Mettie is from the Branch County, Michigan area b 1851. Her family was from Massachusetts and her husbands family (Alphonso Wade) from New York. I noticed Apponetus was also from New York. I am wondering if you have heard of the Smith family or the Wade family or of Mettie? Did Apponetus ever live in Wisconsin?" ADDITIONAL: Mettie Phoebe Smith married Alphonzo J WADE on September 19, 1867, in Branch Co, Michigan. It's been a long time and I was just checking back on the photo of Mettie and the Shaw family. There is a bit more info. 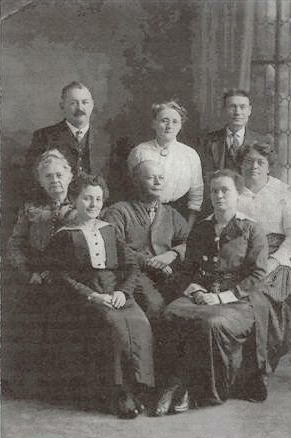 Mettie Phoebe (Smith) Wade (1852-1933) (front left) married Alphonzo Joel Wade (not shown). His sister is seated next to Mettie in the front. Her name is Mary Ameila Wade (1845-1917). She married Frederick Orlando Shaw (is that him in the back?). Her parents were Roswell Wade and Louisa M. Hill, deceased at the time of this photo. I still don't know anything else about the rest of the people in the photo. Additional information about Mettie (Smith) WADE was recently found here. IF YOU RECOGNIZE THESE PEOPLE, please let me know.